The Syrah grapes for Corallina are grown in Crane Vineyard, in Napa Valley’s Oak Knoll AVA. They are pressed whole-cluster, fermented in stainless steel tanks and aged for five months in French oak barrels. About 500 cases of Corallina Syrah Rosé are produced each harvest. This year’s wine is vinified completely dry at 13.8% alcohol and it retails for $25. Corallina's beautiful coral color is striking enough, but wait until you get a whiff. The fragrance of peaches is almost overwhelming. Then come the cantaloupe and watermelon aromas. This isn't just great with a picnic, it is a picnic. On the palate, strawberries and cherries mix with a fresh herbal flavor. Orange peel persists into the finish. It has great weight and acidity to spare. Good, serious fun here. Corallina is in Cornerstone’s “Wine Dance” series, and features the beautiful label art by Janet Ekholm. Picturesque Beaujolais is sometimes called "the Tuscany of France," with vineyards covering nearly every hillside. Beaujolais produces the most single-variety wines in France, and 99% of their production is made from the Gamay grape variety. Moulin-à-Vent is one of the ten crus of Beaujolais, the French wine region lying between Burgundy and the Rhône valley, claimed by both. 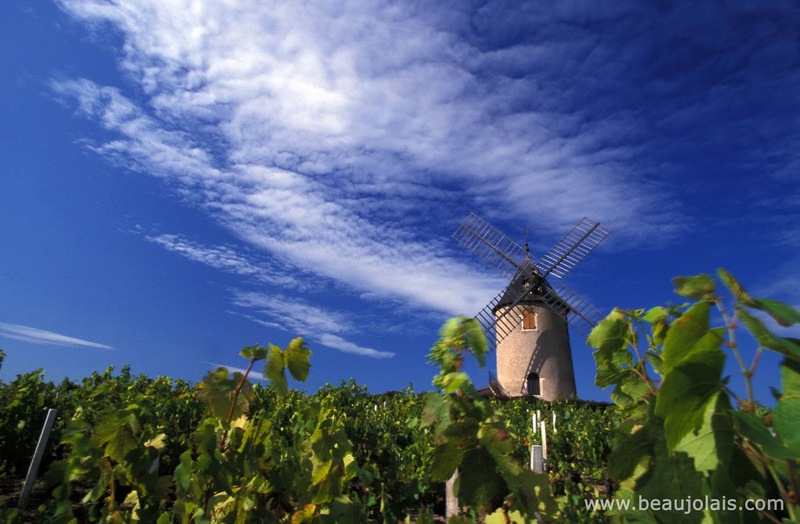 The wines of Moulin-à-Vent are robust and some of the most age-worthy wines in Beaujolais. The soil in Moulin-à-Vent is said to have a rather high manganese content. This mineral is actually toxic to grapevines in high concentrations. In Moulin-à-Vent, the manganese level is just high enough to cause the vines to produce limited yields. This makes the wine’s aromas and flavors quite intense. The 15th-century windmill in the image overlooks the appellation and gives the region its name. It has not been used functionally for years, but it serves as one of the most striking visuals in Beaujolais. Wine importer Kermit Lynch brings this gem to the U.S. It is a widely-held belief that when you see Lynch’s name on the label, you can feel safe that the wine will be good. I've never found a wine that shook that belief. He only imports wines that he feels worthy of being imported. Domaine Diochon Cuvée Vieilles Vignes 2012 is one of those wines. 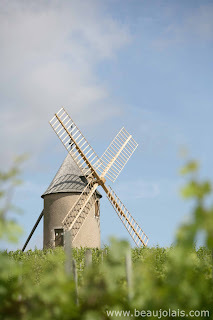 Domaine Diochon is situated literally across the road from the namesake windmill in the photo. What is described on Lynch’s website as the :old-fashioned way" of Beaujolais production has been the story at Diochon since 1935. Bernard Diochon took the responsibility from his father in 1967. Now, Thomas Patenôtre is the man in charge since Diochon’s retirement eight years ago. Diochon likes wines with guts, but not too much weight. 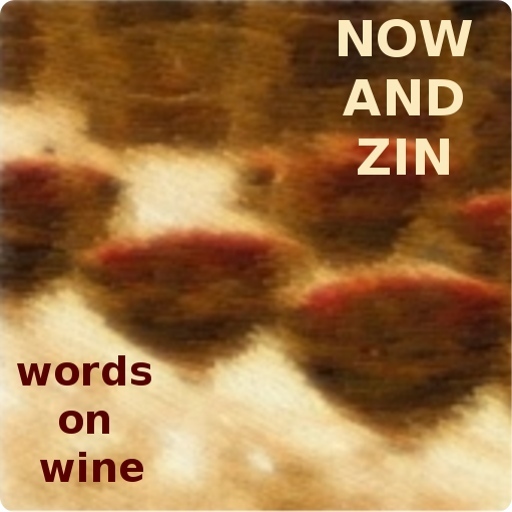 "I like tannic wines without heaviness; with fruit and floral aromas," he said. "Every vigneron naturally chooses to make wines in the style they prefer." Lynch pulls no punches on how much he appreciates Diochon’s "ancestral methods that distinguish real Beaujolais from the mass-produced and highly over-commercialized juice that floods the market today." The wine embodies whole-cluster fermentation in cement tanks, oak aging over half a year and unfiltered bottling. Plenty of minerals are given to the wine through the loose, granitic soil in which the Gamay grapes grow on sustainably-farmed vines that range from 40 to 100 years old. This great example of Beaujolais cru has a beautiful, deep, rich color. Minerals decorate the nuances of the nose, with cherry and black currant taking on earthy notes. True to Diochon's words, the wine feels light in the mouth with a firm tannic structure. Acidity is radiant and it finishes long and luscious. Pierre-Marie Chermette is described as a pioneer of sustainable wine growing in the Beaujolais. His laissez-faire technique means little or no filtration of the wine and no chaptalization, allowing the grapes to speak of the terroir in their own voice. Les Trois Roches 2012 brings the terroir of Moulin-à-Vent to the forefront in a lovely wine, purple at its core with a little brick color around the edge of the glass. The nose is explosive with cassis and blueberry, in a perfumed earth framework. The palate has dark fruit and pomegranate flavors, deep and luxurious. Great mineral notes and a bracing acidity again display the region’s strong suits, and firm tannins allow for the wine to take a seat at any dinner table. It finishes with a slight tartness of black raspberry. It is sometimes remarkable to taste the same wine from different vintages back to back. In the case of Bonny Doon Vineyards’ Le Cigare Volant red Rhône blend, the differences are striking. Not only does the growing season show itself, but the actual blend varies from year to year, making for a wine that is not only a delight, but also a surprise. This flagship wine from the land of Bonny Doon is a Rhônish blend: 28% Syrah, 22% Grenache, 17% Cinsault, 17% Mourvèdre and 16% Carignane. The grapes were picked from a wide assortment of great Central Coast sites: Bien Nacido Vineyard (27%), Evangelho Vineyard (23%), Alta Loma Vineyard (17%), Bechtold Vineyard (16%), Gonsalves Vineyard (9%), Ca’ del Solo Vineyard (5%), Alamo Creek Vineyard (2%) and Enea Vineyard (1%). There is nothing wrong with enjoying Le Cigare Volant right now - it’s hard to resist - but it is billed as a wine that will age gracefully for ten to fifteen years from release, which was in February, 2014. Alcohol is a very reasonable 13.3% abv, 1,344 cases were produced and it sells for $45 per bottle. 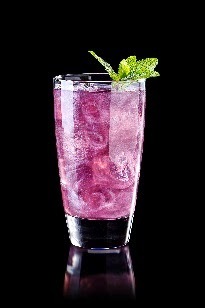 A beautiful purple tint looks great in the glass. It is wonderfully fragrant with cherry tart and a touch of spice, a little light clove. A hint of earth peeks through, but in an elegant way - not rustic. On the palate, black pepper meets blackberry. The mouthfeel is quite full and juicy, and earth notes last well into the lengthy finish. There is a sense of dirt, but it's elegant dirt. Cigare’s acidity is refreshing and its tannins are brawny enough for beef,but its flavors are pretty enough for pork. The 2011 Cigare is a different mix of grapes: 37% Mourvèdre, 34% Grenache, 20% Syrah and 9% Cinsault. The Carignane did not make it into this bottle. The vineyard selections are a bit different, too. Again, eight vineyards contribute fruit, with the addition of Ventana, Del Barba and Rancho Solo vineyards joining Evangelho, Bien Nacido, Alamo Creek, Bechtold and Gonsalves. "This is a wine from an extremely cool and elegant vintage,” winemaker Randall Grahm notes, and he figures this 2011 Cigare will age gracefully for ten to 15 years from right now. Alcohol is almost a full point higher, 14.2% abv, and the bottle retails for $45. The nose is full of red berries, with a dark flair. Raspberry, cherry, and red currant are met with Grahm’s signature savoriness of roasted meat, beef jerky and black olive tapenade. The sip reveals that the ‘11 Cigare is a festival of darkness. The savory aspects come forward in a rush. The forest floor, the olive, the spice - all are cloaked in a dark fruit setting. Black plums, currant and berries work hard to mesh with the wine's earthy character. The acidity is remarkable and the tannic structure is firm. Three fabulous examples of Dry Creek Valley Sauvignon Blanc were tasted, talked about and tweeted up during a virtual wine tasting event. The crowd gathered around a Google Hangout video broadcast on YouTube, while Twitter tasters tweeted about the trio 'til their thumbs tired. Here is the video of the tasting, as it appeared on YouTube. Michelle McCue of McCue Communications moderated the vidcast and led those responsible for the wines in a power hour of lively conversation about what makes Dry Creek Valley good for Sauvignon Blanc. Winemakers Ed Sbragia, Emmett Reed and Tim Bell provided the answers to questions asked by the social media participants. The Twitter event is hashtagged at #DCVSauvBlanc. The Sbragia estate 13-acre Home Ranch Vineyard was planted in 1995, so the Sauv Blanc vines are now really coming into their own. The grapes - all Sauvignon Blanc - were picked nine days into September. They are typically the first of the season to be harvested and made into wine at Sbragia, so the Sauvignon Blanc really sets the tone for everything else they do. This white is 100% stainless steel fermented, hits 13.7% abv and retails for $22. Only 200 cases were produced. This wine has a lovely golden tint - it looks inviting. A whiff shows a beautiful grassy note - a little more than I expect in California Sauvignon Blanc, but not full-bore grassiness like the New Zealand style. Apples and pineapples follow quickly. The palate displays gorgeous green apple, a twist of lemon-lime and a quarry of minerality. Ripping acidity screams for shellfish or crustaceans. Harvested on September 10th from Gustafson’s ​Old Sheep Barn Block, these grapes are a field blend of 80% Sauvignon Blanc and 20% Sauvignon Musque. The wine was fermented in stainless steel and aged in French oak, one-fifth of it new. 350 cases were produced and alcohol clicks in at 14.1% abv. The retail price is $22. They harvested the Sauvignon Blanc during the first week of September and did whole-cluster pressing of the grapes to include the stems and all.Steel fermentation was followed by French oak aging, then finished again in steel. The yellow-gold tint is cheery and bright, while the nose is a bit funky, with white peaches and a waxy sensation. That wax carries onto the palate and meets a savory note on arrival. The acidity is superb and the finish lingers long with stone fruit the last to leave. From Dry Creek Vineyard’s single-vineyard series, the 2013 DCV3 Estate Sauvignon Blanc uses Sauvignon Musqué grapes that were picked starting in late August. DCV3, they say, is the original Sauvignon Blanc vineyard in Dry Creek Valley. Alcohol is ripe at 14.1% abv and 417 cases were made. The bottles sell for $25. Pale color matches the delicate nose in this wine, with minerals and citrus wonderfully underplayed. On the palate, minerality rides herd over peaches and apples. Very pronounced acidity makes a wonderful food pair, while a medium-full mouth has decent weight. Meyer lemon graces the finish with a zing.